The Road Runner Rally is the ultimate banger rally experience covering the Ferrari Museum, Champagne and the Gotthard Pass on its way from Calais to the French Riviera. Ian Barnes from Shrewsbury, a charity banger rally veteren, developed ‘Road Runner Rallies’, with the first charity rally set to take place this year from September 8-13. 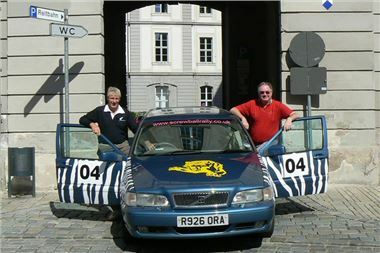 A banger rally sees participants driving a car worth less than £500, in a journey over several days, having a laugh and taking part in events and challenges - all while raising money for charity. Teams are actively encouraged to dress up, decorate their cars and invent a wacky team name. But it is not a race and you can take part at your own enjoyment and leisure and join in as much or as little as you like, though there will be a party each night. In order for Ian to establish the route and all of the tantalizing activities to make the trip one to remember, he avoided everything he didn’t enjoy from his previous banger rallies and put hours into the research. This January, he and his son Chris went on a recce in order to create the ultimate banger rally. They researched the best driving roads, best places to stay and best things to do along the five day, 1,500mile route across Europe. ‘The Riviera Run’ will see participants starting in France near the ferry port of Calais, travelling through the Swiss Alps, past the Italian lakes and then onto the final leg to Cannes and the French Riviera. Ian and Chris are taking part along with Shrewsbury friends Colin Jones and Dan Wright, as team ‘The Management’. They will be raising funds for The Mouth Cancer Foundation. With Road Runner Rallies, the driving times are kept short so you don’t spend too much time on the road – about four hours a day. There is some motorway driving, but driving roads that enable you to see the sights have deliberately been included. All the accommodation, events and optional excursions have been pre-arranged along the way. “We start in France with a welcome party and during the next two days, adventurers can take part in a range of activities, including Champagne tasting, go-karting and a theme park in the snow,” said Ian. “Then it’s on to Switzerland where we will camp by Lake Lucerne and have a barbecue. There is spectacular scenery as we cross the Alps via the Gotthard Pass. Then it’s on into Italy and past Lake Como and Lake Maggiore and from there the finish line awaits in the sun on the French Rivera. The trip is timed from Saturday to Thursday so participants can get home if they want or enjoy a few more days in Europe at their leisure - The Management will be heading to the oldest jazz club in Paris, for example. Overall, Road Runner Rallies is hoping to raise £30,000 for charity through the Riviera Run – it’s up to individual teams what they want to raise for. All cars must be roadworthy and Road Runner Rallies can arrange European breakdown cover for participants. Someone from each team must be sober each morning to drive. Apart from the essentials, Ian and Chris are creating challenges along the way to spice things up and there will be a prize for the best themed car. Two entrants from the local area will be coming as Sergeant Pepper’s Lonely Hearts Club Band. Plus, everyone gets a Road Runner Rally T-shirt and stickers to add to camaraderie. “We will be there to greet people, give you a full guide of the route with details of things to do route including maps and directions for the night’s destination. It’s up to you how you get there! All you have to worry about is burning some rubber! What could possibly go wrong! ?” said Ian. The trip costs just £99 to enter and campsites are £9 with an upgrade to a log cabin or a mobile home from as little as £12.50 for a team of four.